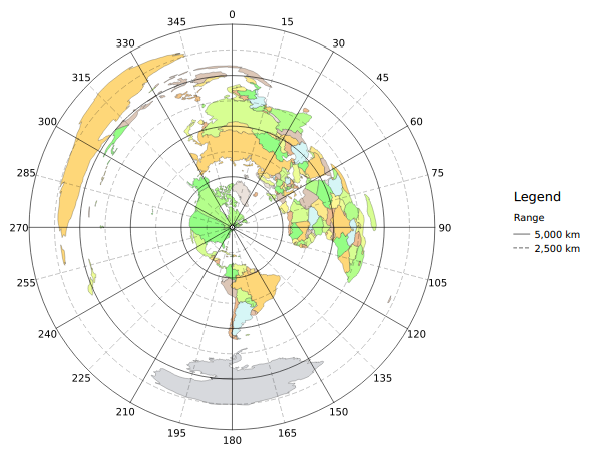 I've put together a toolkit based on the free Quantum GIS (QGIS) software which allows you to easily produce publication quality equidistant azimuthal maps with a nice polar coordinate graticule. This could be useful for aiming a rotor, plotting QSOs, visualizing geographic QSO statistics, and other tasks of interest to the amateur community. I do need more amateur related GIS data; polygons for DXCC entities, call sign prefix areas, stuff like that. Please drop me a line if you know where I can get these. Just open it in QGIS 2. It should already be in pretty good shape for most world map use cases, e.g. plotting DX QSOs. More instructions at the web site.